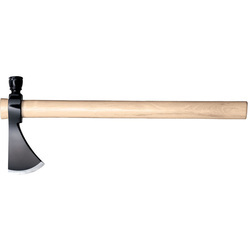 The Best Competition Throwing Tomahawk offers the best quality at the right price, could prove to be harder than expected.The straight grained American Hickory wood handle of the Competition Throwing Tomahawk is extremely durable, able to withstand countless hits and stress tests while at the same time comfortable to hold even when wet. ﻿﻿Click the button to the right for information of the Cold Steel Norse Hawk and it's performance under stressful situations. A review including the hawk specs, customization options, securing the head & sharpening.